Back in August during training camp, I’m sure every Bills fan alive would have said they would be very happy with an 8-6 record going into Week 16. Well, that is the reality and the Buffalo Bills are fighting for a playoff spot with two games left on the 2017 regular season schedule. If the Bills win their final two games they are in the playoffs as a Wild Card team. A loss doesn’t knock them out of the playoffs, but it sure jeopardizes their chances as they would need a lot of help to get that sixth and final slot in the AFC Playoffs. It won’t be easy for the Bills as they have to play the 11-3 New England Patriots on the road. The Bills just played the Patriots three weeks ago in Buffalo and lost 23-3. Not much has changed for ether team since that game, so for the Bills it’s a matter of playing better and executing every play on both offense and defense. While the Patriots have clinched the AFC East, they still are in must win situation, so there won’t be any Patriot starters being rested. The Pats want to earn a first round bye but also secure home field advantage for the AFC Playoffs. As the standings sit now, they need to win each of their final two games in order to do that. 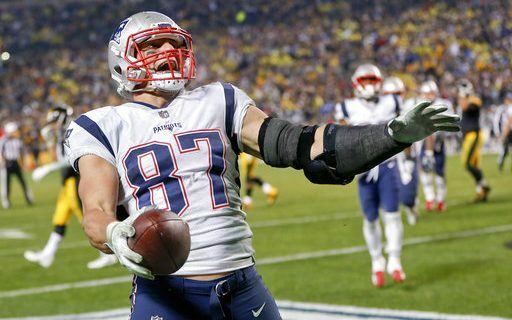 The Patriots are tied with Pittsburgh for the best record in the AFC and because of their win at Pittsburgh last week, they hold the tie-breaker for home field advantage. The problem New England has is that Jacksonville has a 10-4 record and a New England loss could mean they lose that first round bye. After the Bills, the Patriots host the New York Jets to end the regular season. Jacksonville has the toughest schedule of all the Division leaders so a Patriots win over the Bills could very well lock up at worst a first round bye for New England. The Jags go on the road for both of their games playing at San Francisco this week then traveling to Tennessee next week. San Francisco has won two in a row since Jimmy Garoppollo has been starting at quarterback, so that game will be difficult. Tennessee, like the Bills. is fighting for a Wild Card spot. Pittsburgh has to play at Houston and then close out at home versus Cleveland so they have it easier than the other clubs who are involved in this equation. What it gets down to, is the Buffalo Bills are in control of their own destiny and a club can’t ask for more. It’s real simple, win and you’re in! A win won’t be easy as the Patriots quarterback Tom Brady is still one of the best quarterbacks in the business. He may be 40 years old and not playing at the same level as he was five years ago but he is still darn good. The Bills on the other hand will be going with Tyrod Taylor at quarterback, who has serious limitations when it comes to throwing downfield. In order for the Bills to win this game they have to play mistake free football. That means a strong running game, a minimum of penalties and controlling the clock. The have to run the ball well, stay on schedule and move the chains. When they get in the red-zone they can’t settle for three, they have to score touchdowns against a team like New England. On defense it’s imperative that the Bills pressure Brady. There isn’t a quarterback alive who can read defenses like Brady, so getting strong immediate pressure is a must. They also have to limit the number of plays Rob Gronkowski makes. The Williamsville native seems to always come up big against his hometown team. Though the Bills are a vastly improved football team, I just don’t see them being able to pull this win off. With the game being on the road and the teams lack of experience in big games will work against them. If that happens to be the case, Bills fans have a lot to be proud of as this team is not that far away from being a perennial contender. A solid Draft and free agency period will put the Bills in that position for years to come.